The fabric of the community of a small Jersey shore town is torn apart in the wake of the mysterious disappearance of young Leonard Pelkey. At first this one-man show, written and performed by James Lecesne, follows the lines of every crime drama you have seen. Yet, The Absolute Brightness of Leonard Pelkey proves to be much more than superficial intrigue and ends up challenging the very conscience of society. The standing ovation and second curtain calls this show has been receiving in previews are already setting this piece of theater apart. At the very moment Lecesne shifts character from stern Jersey detective Chuck to grieving guardian Ellen Hertle, things change. There is an almost discernable sparkle in Lecesne’s eye as he switches roles in the play: as if every moment he is about to show us his next favorite part of the play. The voice and the mannerisms change so fluidly that if you didn’t know better you would swear a new actor had appeared on the stage. Director Tony Speciale has done a superb job in keeping every transition believable and honest, with characters both lovable and loath-able. A few characters in and the tone of the play shifts; now while faced with the blurry picture of a blonde hair, bright eyes, “don’t care what the world thinks of me” young 14-year-old, (a boy with nothing but love to give) a community of deep-seated hate reveals itself. It becomes all too apparent that this was a hate crime. Here the next challenge for Lecesne appears. With such a heavy subject matter, it is a testament to the Lecesne’s writing and acting ability that the play continues with welcome momentum and humor while having the blended balance of touching sentiment. The wonderful characters ranging from the gentle old clockmaker to high school jocks come from Lecesne’s very own young adult novel Absolute Brightness, published by Harper Collins, that has received The William Morris Award by the American Librarian Association and was nominated for The Lambda Literary Award. The theme of the play comes as no surprise as Lecesne himself is the co-founder of The Trevor Project, the only national 24-hour crisis intervention and suicide prevention lifeline for LGBT and questioning youth. He wrote the screenplay for the Academy Award-winning short film Trevor. 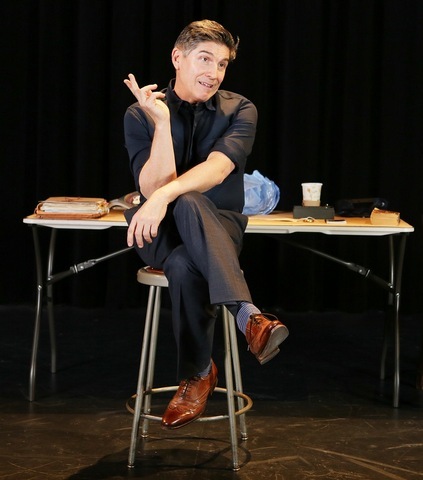 Among other stage productions, Lecesne has also been a writer for Will and Grace and the Emmy nominated Showtime program Armistead Maupin’s Further Tales of the City. Lecesne is a man of great social conscience and this new play is yet another of his gifts to society. Dixon Place has been home to many great theater projects. Their mission as a not-for-profit organization is a commitment to supporting the creative process by presenting original works. It has housed the origins of many artists, such as Blue Man Group and Deb Margolin. 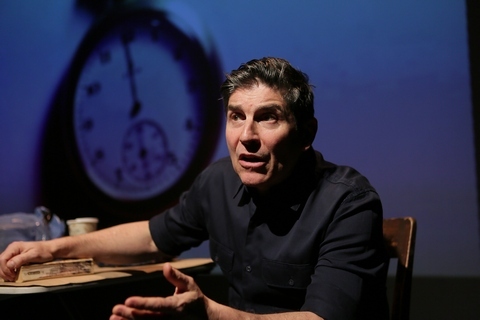 Now home to Lecesne’s work, you will be amazed at how powerful a simple set in this intimate theater, with just the appropriate touch of visuals (Matthew Sandager) and incidental music (Duncan Sheik), can be. Be sure to go and enjoy the Dixon Place Lounge before and after the show as proceeds from the bar go directly to support Dixon Place’s artists and mission. First new musical to reach NYC from songwriting team that wrote “Spring Awakening” opens new MCC Theater with an updated “Alice in Wonderland” set in W.W. II London during the Blitz. Magic, suspense and puppetry cast a spell on audiences as the talented puppeteer, performance and visual artist James Godwin comes to Dixon Place.